It’s true: John McLaughlin once worked the pop scene. The guitarist, whose name would become synonymous with 1970s jazz fusion, started out in 1960s London as a session player for the likes of Dionne Warwick & Burt Bacharach (What’s New Pussycat? soundtrack), Andrew Oldham Orchestra (“365 Rolling Stones (One for Every Day of the Year)” – 45 only! ), Tony Meehan Combo (“Song of Mexico“), David Bowie (“Karma Man“), and The Hairy Ones (“Get Off My Cloud“), among many others. McLaughlin would also be part of a 25-member assemblage of “musical stunt men” (as drummer, Bobby Graham, would quip*) who would join forces on February 23, 1965 at Pye Recording Studio for a classic album – British Percussion – that was never released on this side of the Atlantic. This “all-star” band – who had previously backed such top French artists as Eddy Mitchell, Françoise Hardy & Sylvie Vartan – would be assembled at the behest of bandleader, Bobby Graham, with the blessing of label magnate, Eddie Barclay (previously featured in a Zero to 180 piece about the Parisian “guitar army,” Barclay Stars). 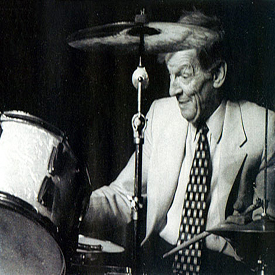 “British Percussion was Eddie Barclay’s semi-blank cheque to Bobby Graham to pull some people together and sell a slice of Swinging London to the French. Sales-wise, it might have sunk like a stone; musically, especially as a sonic snapshot of an era, it’s a delight from start to finish. In a way, it is exactly how one imagines, through the prism of posthumous pastiches like the Austin Powers soundtracks, Swinging London sounded. “Animal is performed and voiced by Frank Oz while his drumming is performed by Ronnie Verrell. Fans of The Who’s drummer Keith Moon claim that the character of Animal was based on Moon, who was known for his wild antics. However, there is no evidence in the original sketches for the character that suggest that he was based on anybody in particular. 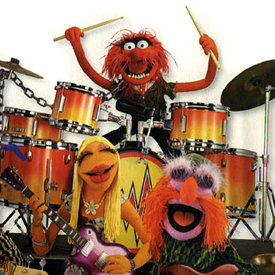 Three of the other members of the Electric Mayhem were created by Muppet designer Michael K. Frith, and the sketches reproduced in the book Of Muppets and Men show that they were based on famous musicians. Dr. Teeth is a cross between Dr. John and Elton John; Sgt. Floyd Pepper is based on the Beatles’ Sgt. Pepper album, and the original concept for Janice was a skinny, long-haired male character based on Mick Jagger. 1993 would see the UK release of a single by Animal as a solo artist that would reach #39! 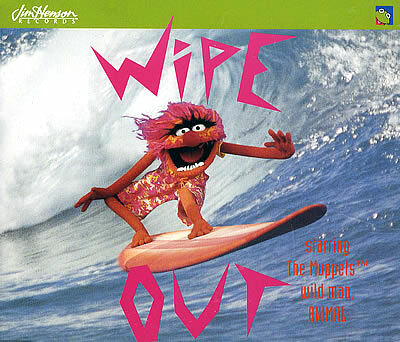 This entry was posted in "Stop the Drums", Jim Henson, Muppets in Popular Music, Ronnie Verrell by Zeroto180. Bookmark the permalink.